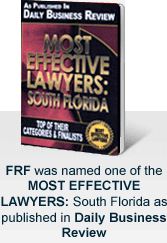 At the law offices of Friedman, Rodman & Frank, P.A., our Naples personal injury attorneys aggressively pursue all possible avenues to get you the compensation you need. If you or someone you care about has been injured at work, workers' compensation may be one of those avenues. It may not be the only one. We handle all Florida on-the-job injury cases, including construction accidents and accidents involving all other occupations. Through workers' compensation, victims of these workplace injuries may be eligible for medical care, wage loss benefits and possibly lump sum settlements. Workers' compensation laws are complicated. They change frequently. It is critical that you have a lawyer on your side who has the experience to resolve these matters effectively. We have decades of experience. Workers' compensation claims are not the only avenue. We also may be able to file a personal injury claim against a third party that was responsible for the injuries. Third parties may include subcontractors, vendors or property owners. Claims may also be filed against the manufacturer of a defective piece of equipment that caused the accident or made it worse. It is important to consider these options because they can help to maximize compensation. We thoroughly investigate all cases, making certain that no option is overlooked. In the process, we show many injured workers that they have more options than they thought. Call us toll free at 877-448-8585 or contact us online to speak directly with a Naples workers' compensation attorney in English, Spanish or Creole. Se habla español/Nou parlé Creole. We are available to assist you 24/7.